Women seek breast implant revision for a variety of reasons. Whether it is the size of the implant, changes in overlying breast tissue or issues with the implant itself that prompts a woman to seek consultation, breast implant revision surgery can help you reach your goals. Have you ever wondered why there are so many choices available when it comes to injectables? The goal of almost all injectables might be the same: to minimize the appearance of lines and wrinkles on your face. But, the way the injectables go about doing that varies from product to product and from ingredient to ingredient. The ingredients found in the more popular injectables, such as Radiesse, Botox or Juvederm, are all different from each other in some way. Understanding what each ingredient is and how it helps reduce your wrinkles will help you pick the injection that will give you the result you're after. People tend to associate nasal surgery, particularly rhinoplasty, with a certain amount of vanity about the appearance of the nose. While one of the main reasons why people consider rhinoplasty is to improve aesthetics, appearance isn't the only thing that drives people to surgery. Issues with the way a person's nose functions, as well as a congenital deformity or damage that occurred later in life can all play a part when it comes to deciding whether rhinoplasty is an appropriate choice or not. A deviated septum is simply a septum that leans to one side or other, decreasing the size of the nasal passage in one nostril. The constricted nasal passage can make it difficult to breathe or can lead to facial pain and bleeding from the nose. Not every person with a deviated septum requires surgery to correct it, but surgery is the only way to actually repair the issue. For some people, managing the symptoms caused by the deviation is enough. Some people also don't experience any trouble breathing or have any other issues, even though they have a deviated septum. Women today know that full lips are a desirable trait, but not many women are born with lips as full as they’d like. What’s more—the aging process is often responsible for depleting some of the natural lip volume women are born with, making it even harder to maintain that youthful pout. Luckily, today’s cosmetic procedures, both surgical and nonsurgical, can help you to achieve the full lips you’ve always wanted. Through lip enhancement, your facial plastic surgeon can work to create lips that are more noticeable, better balanced with your other features, and as feminine as you hoped. Not all facial surgeries are performed solely for anti-aging purposes. Facial implants, for example, can provide many other benefits to men and women of various ages. Chin and cheek augmentation can be performed as a dual procedure or individually, based on the patient’s unique facial structure and desired results. The right facial implant can make a dramatic difference in your facial harmony, balance, profile, and appearance. There are many reasons that patients pursue chin or cheek implants, some of which might sound familiar to you. Do you wish you could look and feel more like the way you did before pregnancy? If you could change your body to appear more youthful, toned, and firm, would you? The Mommy Makeover procedure might sound too good to be true for many prospective patients in their post-childbearing years, but these dreams can become reality. By assembling a surgical plan and combining the right procedures into one surgery, the Mommy Makeover can reshape your body and give you a second chance at looking the way you have always wanted. A number of procedures can be included in a Mommy Makeover, so it’s important to understand what changes are possible for your body. Facelift surgery is an investment of your time and money, so of course, you want to achieve the very best results possible. Your results should look natural, take years from your perceived age, and even enhance your own beauty. Visible incisions and scarring can ruin the effect, so it’s essential that you take precautions against these unwanted side effects. Follow these surgeon-recommended strategies to minimize the scarring after your facelift surgery. There are many designer plastic surgery procedures available today, each created to serve a specific purpose. The profileplasty is one such procedure that combines two surgeries into one with the goal of reshaping and refining a patient’s profile. 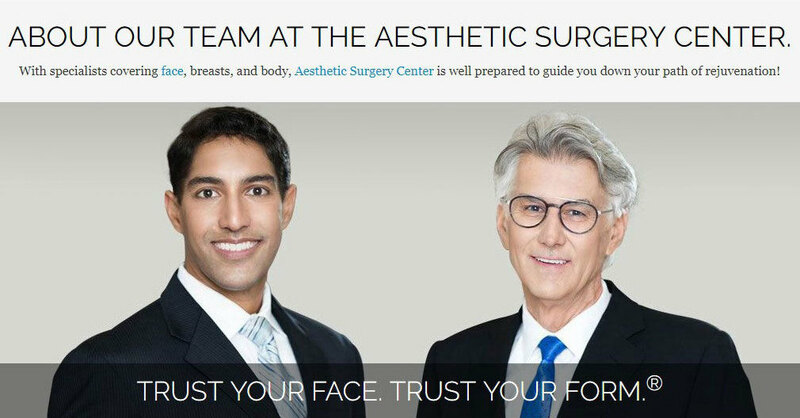 This unique facial plastic surgery procedure includes a rhinoplasty and chin augmentation in order to balance the facial structure and provide harmony among the patient’s features. If you’ve considered either a nasal surgery or chin implant, could you benefit from a combination procedure? For at least a decade, Botox Cosmetic has been making itself a household name by eliminating wrinkle after wrinkle. Approved by the FDA as an anti-aging wrinkle treatment, Botox works to temporarily paralyze the facial muscles responsible for causing the creases in the skin that result in wrinkles. Not only can this diminish the appearance of your existing wrinkles, it can also work as a preventative measure against the formation of new lines and wrinkles. Botox is an ideal treatment for the small muscle groups of the face, often providing results that last up to a year. Today’s facial plastic surgeons have refined their techniques to deliver Botox treatments for a wide range of uses.